Over the Winter season I tend to read a lot, and I think this is partly due to being stuck inside (and what better way to be than with a book and cosy mug of something hot) and also the fact that prelims begin in January – procrastination. I received a few books for my Christmas this year, so I thought I would swing into my book reviews again as I’ll have a few to do! 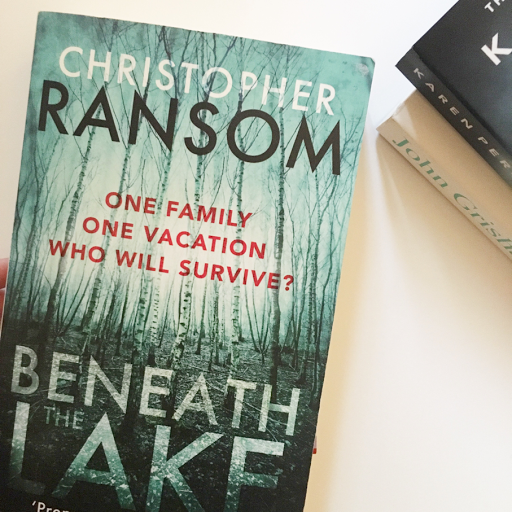 I’m going to start with a book I read not long before Christmas called “Beneath the Lake” by Christopher Ransom. It was the first book I had read by him, as I don’t often read books for their authors but just their plot. Of course, this is yet another creepy thriller that I always seem to choose but that’s just my style of genre… Anyone else that reads will know it’s hard to venture away from your favourite genre’s! The synopsis didn’t give too much away about the novel, but still left me intrigued enough to pick it up and buy it. The novel tells the story of a family who decide to reunite at a massive lake which they always used to years ago when they were younger, but stopped after a strange event and tragedy that occurred 30 years ago while they were there. You re never revealed the truth of this event until later on in the novel, which left me curious and kept me going. I was very surprised to learn that this was quickly a supernatural thriller. The opening of the novel was pretty violent but also gripping. However, it was very confusing and left me puzzled so made me keep going. When they all decide to reunite at the lake, I know that my questions are going to be answered. All that I had gathered so far was that there was something supernatural going on at the lake, and when they returned, it was likely they were going to face it again. Ransom kept up the creepiness of the plot throughout the whole novel, however it was a lot more confusing than I had expected. A lot of backward page turning occurred, making sure I hadn’t missed anything out. I kept predicting what was going on, and then be proved wrong and it wouldn’t happen. Usually this is what I love about thrillers, but this time, not so. I almost felt like it dragged on slightly towards the end, and everything was getting a bit muddled up and exaggerated. Upon reading the ending, I was slightly disappointed as I felt I could have probably ended it in a better way. This may be because of my confusion – I still right now have absolutely no clue what really happened at the end and I even tried googling with other reviewers saying similar. However I do think it was a really exciting novel to read, the ending was just a little bit unclear to me and I don’t like that. Trekking through a novel and having an unsatisfied ending sometimes leaves me annoyed and exhausted. Overall, if you like supernatural thrillers with a sort of mysterious ending then definitely give this a read and you might be able to understand it a bit better than I can!